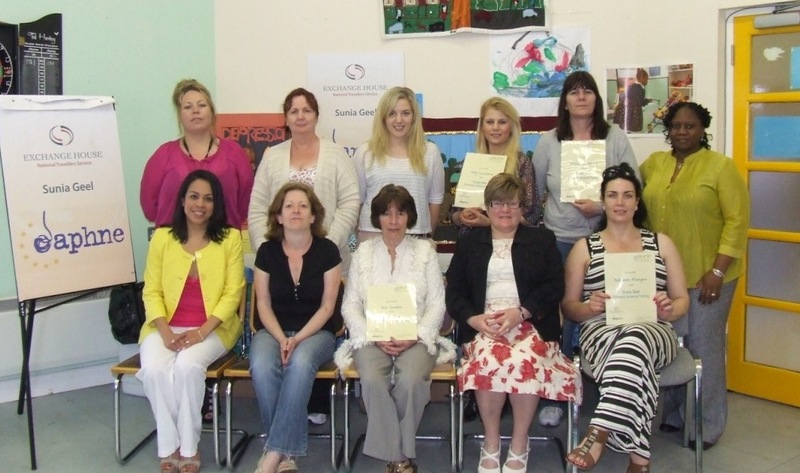 The Primary Health Care Workers in Balbriggan have successfully completed our ‘Sunia Geel’ Domestic Violence training. The Primary Health Care Coordinator got in contact with the Family Support Service and expressed her interest in making the training available to the group of primary health workers in her area. From there we organised six morning sessions that were facilitated by a social worker and a family support worker from Exchange House. The training used a range of learning methods such as oral presentations, small as well as big group discussions, brainstorming, use of DVD’s as well as role plays. The training was as interactive as possible and group participation was very good. The training highlighted the issues of domestic violence in general but it also raised awareness of the many ongoing problems and barriers that women face. At the end of the training sessions the women received certificates of attendance and we celebrated this by posing for pictures and having tea, sandwiches and biscuits.